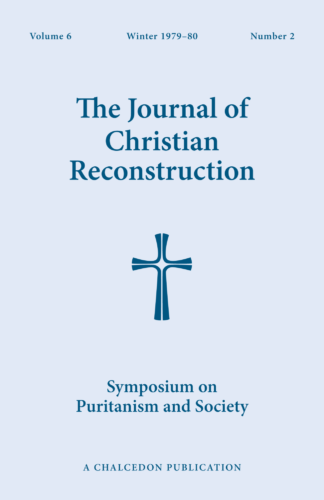 In the third and final issue of The Journal of Christian Reconstruction that is devoted to a study of the Puritans, the contributors survey the impact of Puritan sermons, thought, and law on society in general. There is little doubt today that the Puritan movement in England and the New World helped to reshape the basic institutions of the Anglo-Saxon world. In previous issues, we have surveyed the Puritan views concerning civil law, economics, science, and other kingdom institutions. Now we focus on those aspects of Puritan life that concerned the family, the institutional church, music, death, and Cromwell's Protectorate. These three issues of The Journal have created considerable controversy. The idea that Puritanism was essentially a "package deal"—a comprehensive world-and-life outlook that affected all spheres of social life—has alienated numerous self-proclaimed neo-Puritans. This series has also driven another group to abandon the Puritan tradition, and to adopt a kind of neo-anabaptism to replace the older "theonomic" Puritan tradition. The "reprinting neo-Puritans" have faced a dual challenge: either adopt the theonomic tradition which was fundamental to the Puritan movement, or else abandon Puritanism's tradition in favor of new-anabaptism. Predictably, they wish to do neither. Yet to remain "betwixt and between" is to remain caught in a crossfire. The interesting product of this immobility has been a narrowing of focus: endless articles on the ("beneficial") emotionalism of Puritanism, and a stream of biographical articles, primarily dealing with the less well-known later preachers who have defended predestination, but who had little or no lasting influence on Western culture, and who were not explicitly Puritan in their outlook. The world can never be reformed. Never! That is absolutely certain. A Christian State is impossible. All the experiments have failed. They had to fail. They must fail. The Apocalypse alone can cure the world's ills. Man even at his best, even as a Christian, can never do so. You can never make people Christian by acts of Parliament. You can never christianize society. It is folly to attempt to do so. I would even suggest that it is heresy to do so The Christian must never get excited about reform, or about political action. That raises for me a problem with respect to the men of the 17th century and other times. It is that they should have become so excited about these matters. I would argue that the Christian must of necessity have a profoundly pessimistic view of life in this world (p.109). No; I'm afraid I don't agree. It seems to me that our Lord's own emphasis is quite different, even opposed to this. . . . You can't reform the world. That's why I disagree entirely with the "social and cultural mandate" teaching and its appeal to Genesis 1:28. It seems to me to forget completely the Fall. You can't Christianize the world. The end time is going to be like the time of the Flood. The condition of the modem world proves that what we must preach more than ever is "Escape from the wrath to come!" . . . The main function of politics, culture, and all these things is to restrain evil. They can never do an ultimately positive work. (pp. 161-62). Whatever politics you adopt, he says, should be liberal; whatever economics you adopt, of course, should be interventionist. Not impressed by biblical law. Dr. Lloyd-Jones falls back upon the conventional "unconventionality" of late-twentieth-century British politics—all in the name of liberal innovation. He ignores the fact that the dominion covenant was reestablished, after the Fall, with Noah. The Fall has now become an excuse for not doing anything to cure its effects. However, he said in his 1975 essay, "Looking at history it seems to me that one of the greatest dangers confronting the Christian is to become a political conservative, and an opponent of legitimate reform, and the legitimate rights of people" (p. 103). But if explicitly Christian reform is doomed, what kind of "legitimate reform" does he have in mind? Why, "Calvinist reform," meaning economic interventionism, since Arminianism supposedly leads to laissez-faire: "Arminianism over-stresses liberty. It produced the laissez-faire view of economics, and it always introduces inequalities—some people becoming enormously wealthy, and others languishing in poverty and destitution" (p. 106). Free enterprise creates inequality! If these conclusions seem preposterous to you, you will want to order the latest Journal of Christian Reconstruction, which contains my article showing how free enterprise economics came to the Puritan colonies iii the final years of the 17th century. You will want to read Gordon Geddes' essay on the Puritan view of death, Greg Bahnsen's defense of biblical law against Merideth Kline's attack, Rita Mancha's study of women in Calvinist thought, Richard Flinn's essay on the Puritan concept of the family, James Jordan's essay on Puritanism and music, and David Chilton's defense of Oliver Cromwell. "Puritanism and Society" will provide you with information which will enable you to decide whether Dr. Lloyd-Jones' assessment is correct, whether his view on 17th-century Puritanism's outlook is truly heretical.